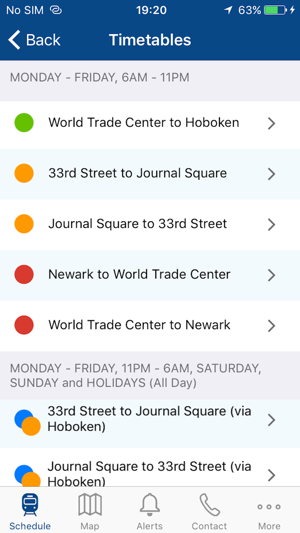 The official RidePATH app provides schedules, trip-planning and alerts, all in one convenient place. 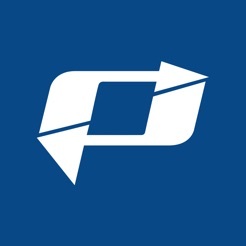 PATH is a wholly-owned subsidiary of The Port Authority of New York and New Jersey. • Updates to weekend service maps during closure periods having modified service. • Please refer to the PANYNJ Privacy Statement for data collection and use. The app is quite visually helpful, but it appears to only show scheduled departures. 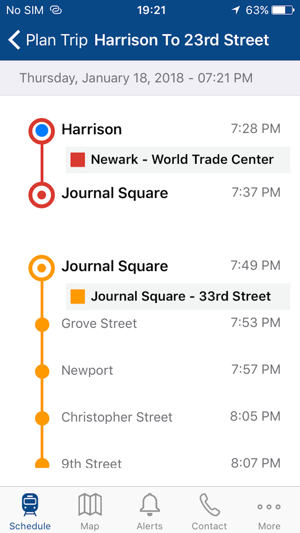 So, where the app says the next train to leave the WTC is a Hoboken train, all too often a Newark train comes in after the Hoboken train, but leaves before the Hoboken train, and vice versa. 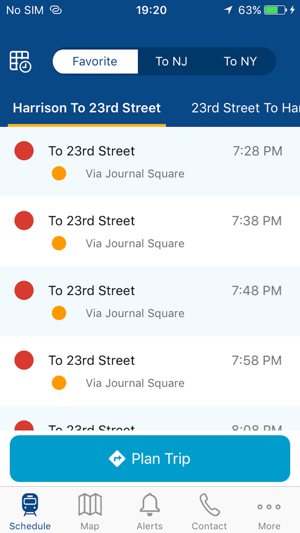 This is annoying because the trains leave from different platforms, and since PATH does not provide announcements about which train is actually leaving first, this app ends up providing frustration for those passengers who only want to go to Exchange Place. This occurs at least once or twice a week. 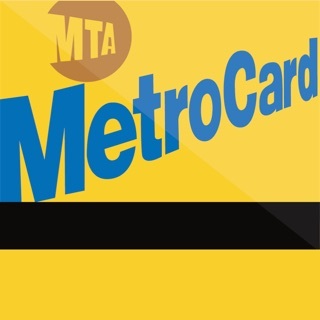 The app also does not take into account trains that are taken out of service late in the rush hour. So while there may be a 10:12 train leaving on the Newark platform, when it arrives and is marked “no passengers,” you may or may not have time to get to the Hoboken platform and the train that is sitting there, ready to leave. 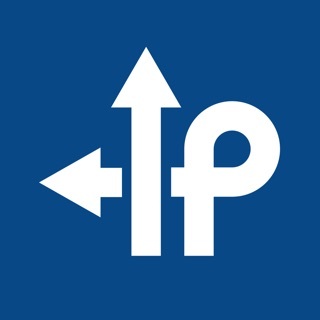 Until PATH IT improves its software to be more accurate, I recommend not bothering to download it, remove it if you already have it, or ignore its information for now, or at least take that information with a large grain of salt. Maybe this app will be useful in some future version. 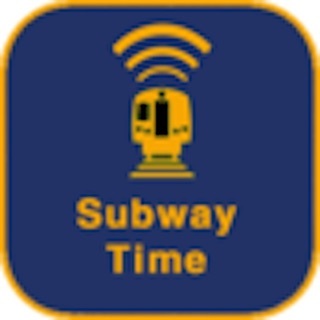 Claim: pushes real-time alerts and travel info when you arrive at the station. Reality: pushes the published timetable. Actual arrival/departure times and info about delays are NOT sent. For instance, service was delayed this morning and yesterday, yet the app did not send that info when I arrived at the station either day. Claim: Includes maps of the PATH system. Reality: The maps are tiny and unreadable on a phone and you cannot scroll/zoom. Claim: This is a useful new tool for PATH commuters. Reality: it looks like a high school kid’s coding project and you still need to follow PATHtrain on twitter to get delay alerts. 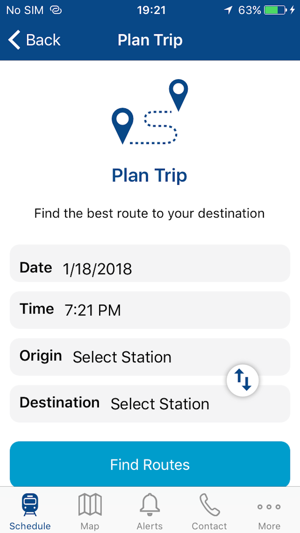 The only positive thing I can say is that getting the scheduled departure times sent to your phone beats watching the departure times scroll sllllowwwwwllllyyyyy across the bottom of a PATHvision screen. The real time departure is the best feature. There needs to be a better way to navigate stations though. It should be the primary feature and I should be able to click on a station without having a mile wide selection at the top. 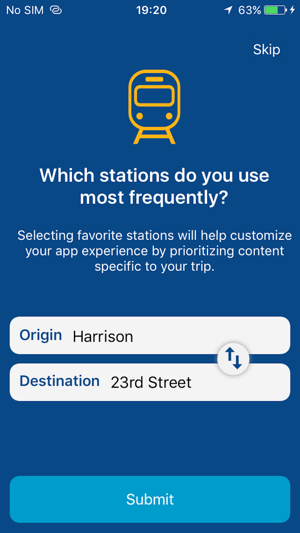 I should also be able to favorite a station for real time.